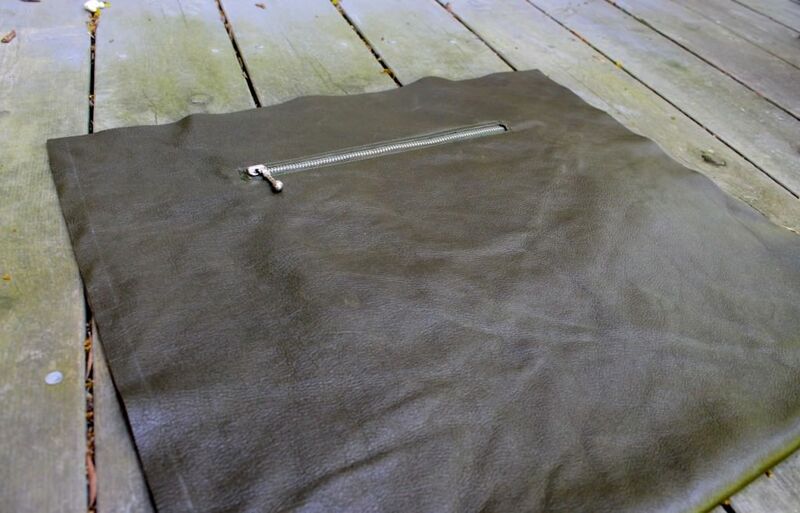 The Georgian tote is made from a remnant of leather and I had just enough to do it. I seem to work well under that kind of pressure. 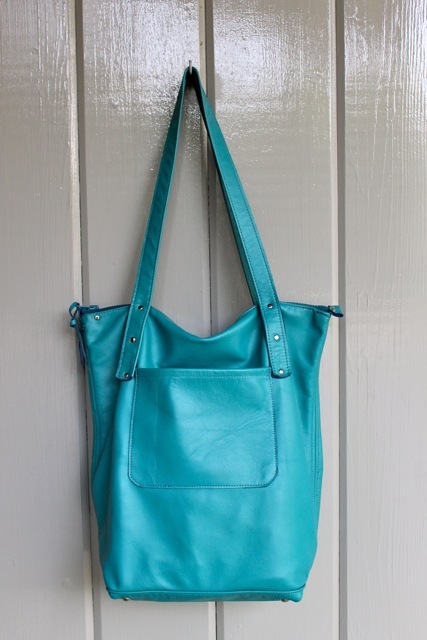 I am also making a second tote from leather upcycled from a coat–an even greater restraint (but more on that later, I hope). Back to the Georgian. 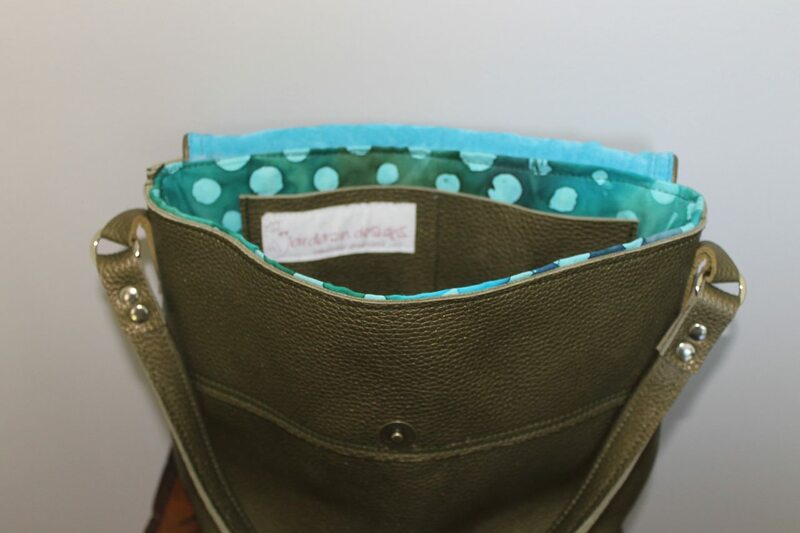 This is a rough tote, so it is unlined, with a double bottom and studs for protection. 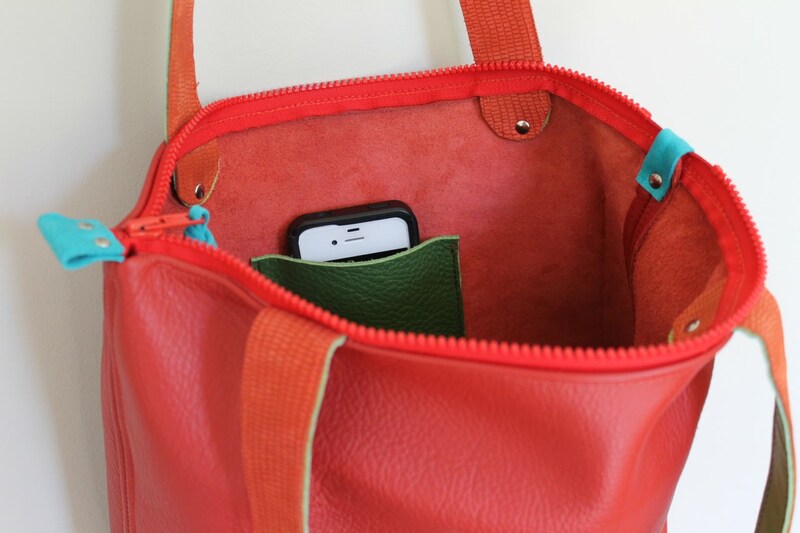 It has an exterior and interior pocket and a clip for your keys. 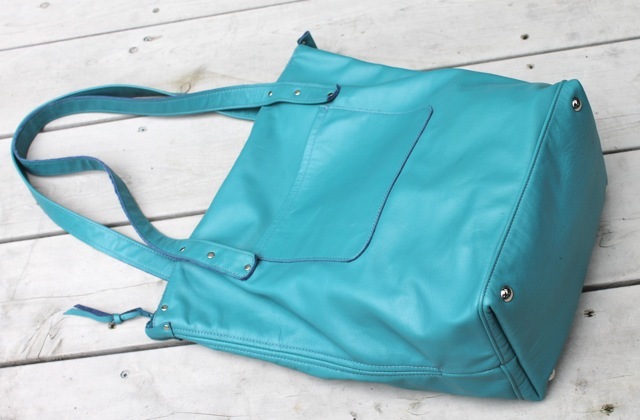 It is made from a great piece of leather and will wear well, but it is not as stiff as some of the other rough totes. It slouches a bit when you set it down–a quality I rather like. H 14″ W 14″ D 6″. 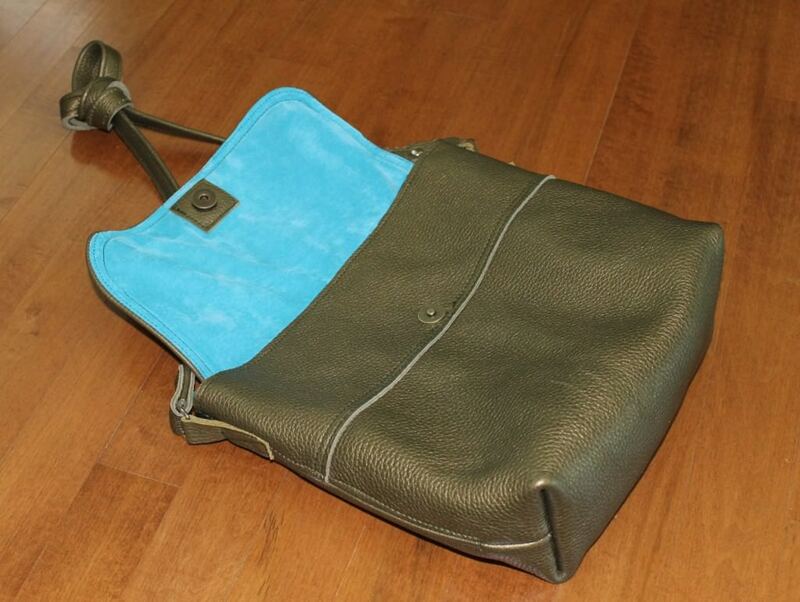 Handles are attached by three rivets and have a 12″ drop for comfortable carrying. In the on-line shop today. In last week’s primitive class I decided to try my hand at a self portrait. We took my picture on a phone and then sent it to Wendie’s computer where she opened it in a program called Be Funky which isolates the blocks of colour. Using the picture on the computer as a guide, I made a simple sketch. I had a basket of dyed nylons which I thought would be great to use. I ended up adding all kinds of alternative fibres–yarn, sari silk, roving and ribbon. It was really freeing to use all the different textures and I especially enjoyed using the thick and thin slub wool as background. The hooking went very fast. I plan to hang it on the wall of my studio along with my soon to be finished shoes, another form of self portrait. A big thanks to Wendie for her inspiration. 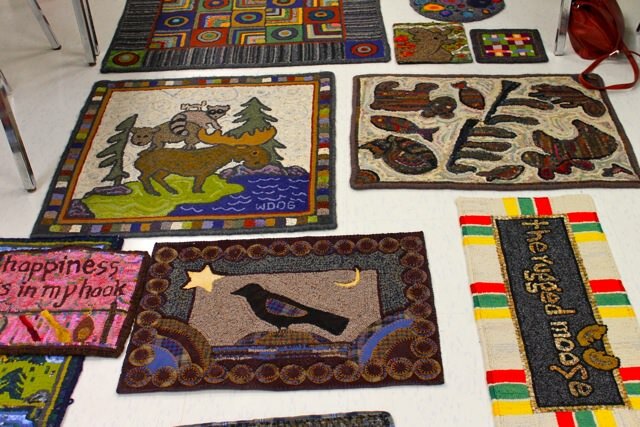 Here are the rugs which we began in the primitive rug course with Wendie Scott-Davis. 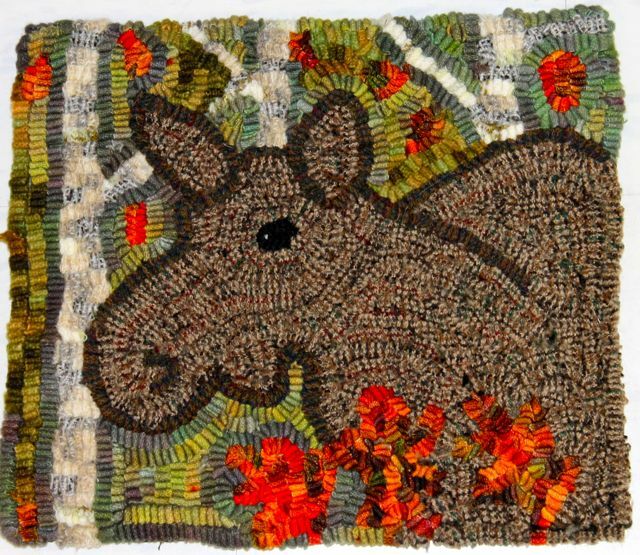 The really interesting parts of a rug hooking class–besides the things you learn and we all agreed we learned TONS from Wendie who is such a generous and experienced teacher–are the stories that come as rugs are hooked. Each of the pieces below reflects its creator in design and narrative. 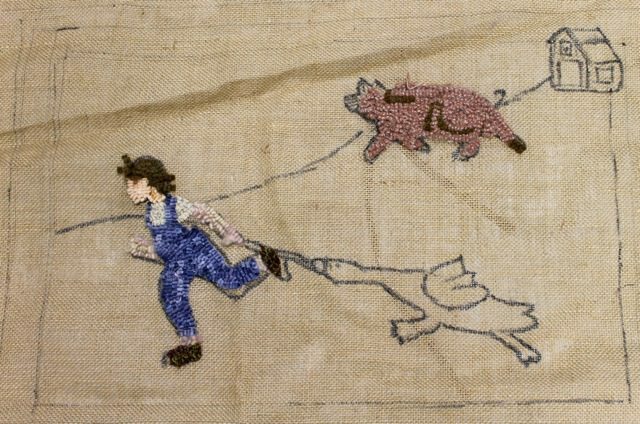 First you see Mary Anne’s Iggie the Piggy and Nancy’s story from her husband’s childhood. 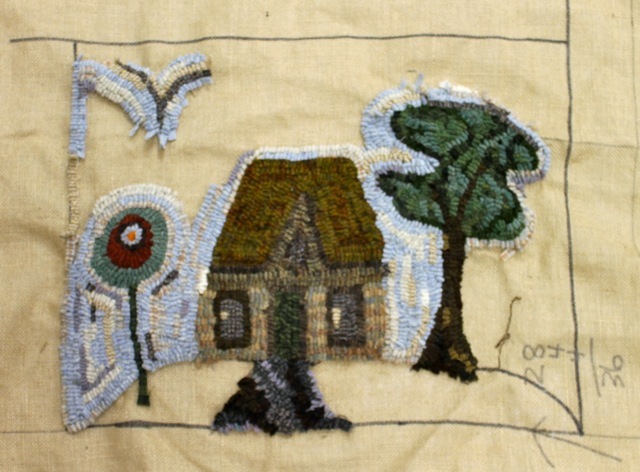 Next, work from Cindy, Jane and Carol–each with their own twist on the primitive principles. 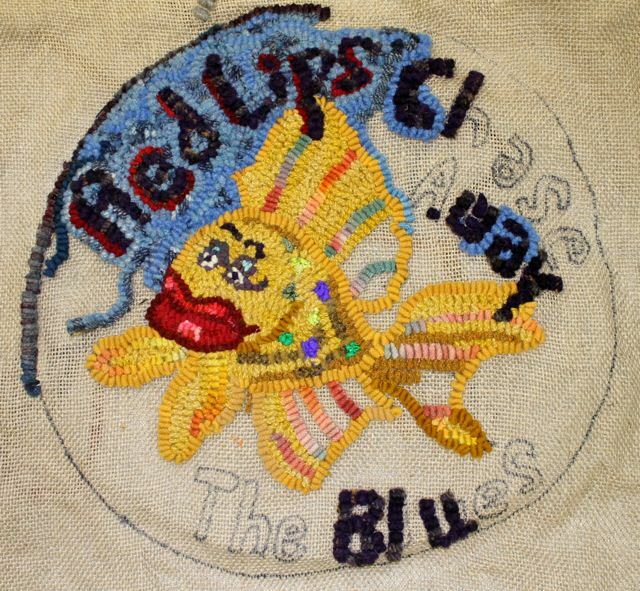 And finally a Maud Lewis from Deborah and a ‘hot’ fish from Maribeth and Harley’s moose. What fun we had! 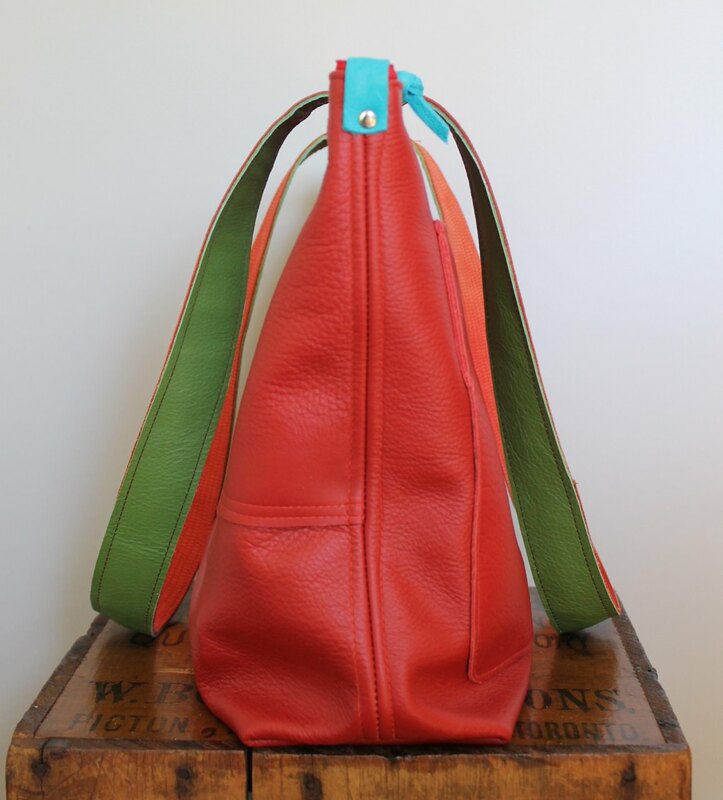 I started the day off with this lovely email: I love my new red bag. It’s scrumptious, lovely, beautiful, it smells wonderful and I feel blessed to have it. I took it to book club yesterday and wowed the gals. Everyone appreciates positive feedback and this lovely comment has put a smile on my face this morning. And there is more to smile about–it is a beautiful sunny morning here and it’s day two of an excellent hooking workshop I am attending. 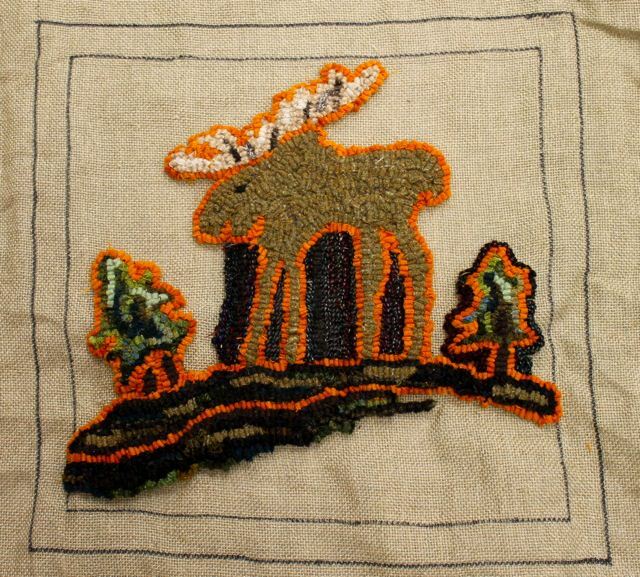 You no doubt recognize the work of The Rugged Moose. We are so lucky to be able to spend four days here with Wendie learning about primitive rug hooking. 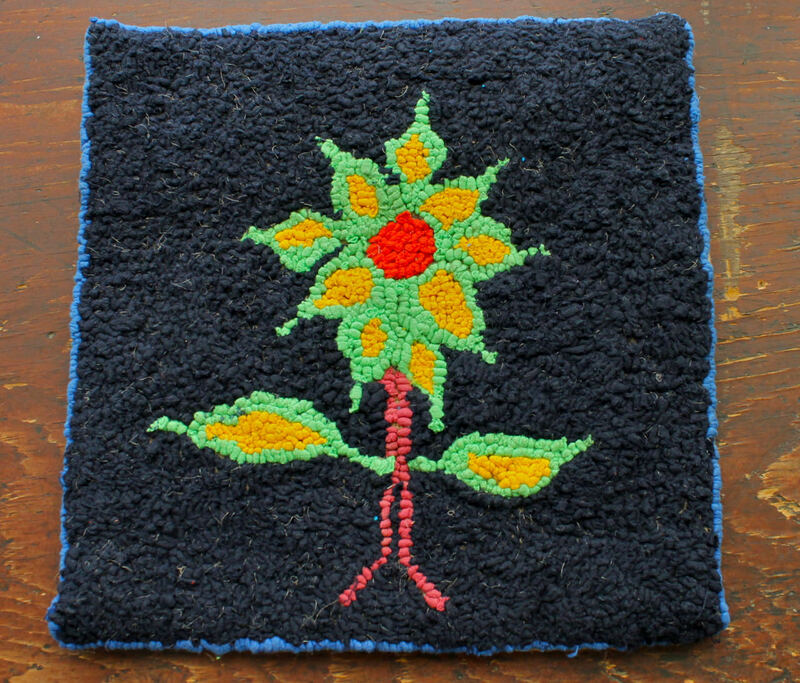 Primitive rug hooking with a definite techno twist! It is already an outstanding course. I will post some of things we are working on soon–but for now here are some of the fabulous rugs that Wendie brought to inspire us. The Sage Delta is finished and ready for delivery. 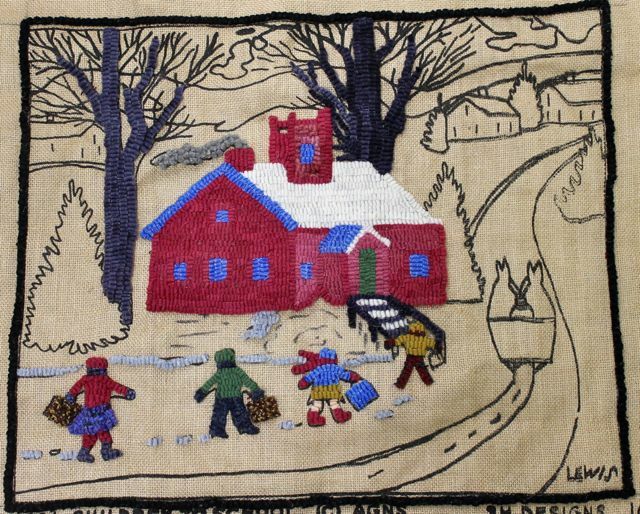 This tote is 17″ wide, 15″ high and 6″ deep. It has a double leather bottom with feet to protect it. 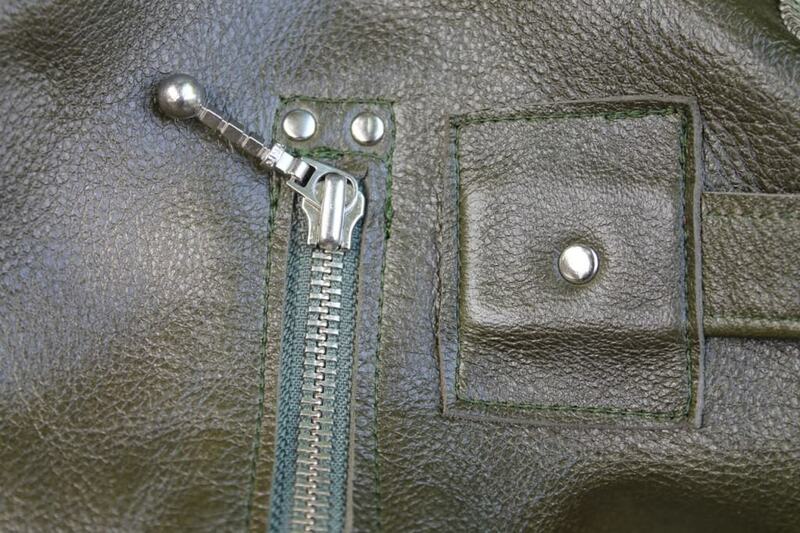 The deep zipper pocket on the front is cut into the leather. 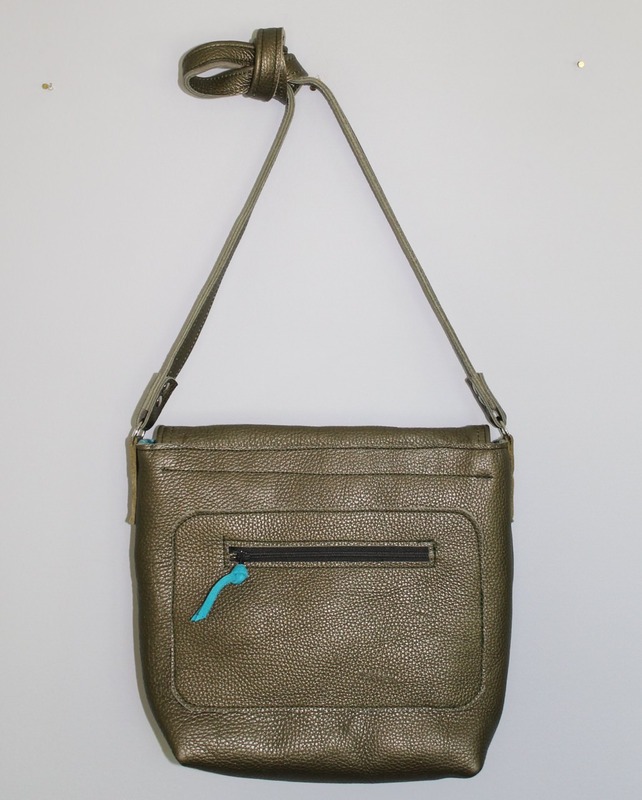 The handles have a 10 inch drop and the ample shoulder strap makes a good alternative–or can be unclipped and stowed away. 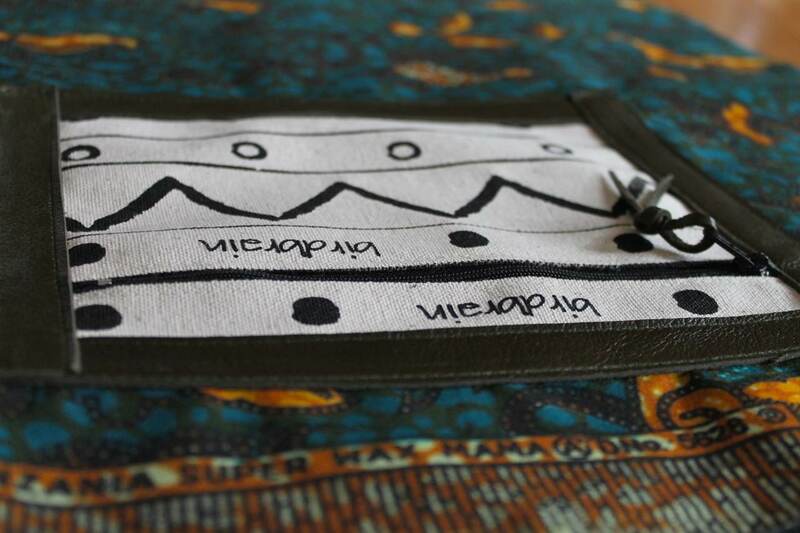 Inside is a canvas zipper pocket and a leather phone pocket sewn on lovely Tanzanian cotton. All in all a great travel tote. The new tote is well on its way. 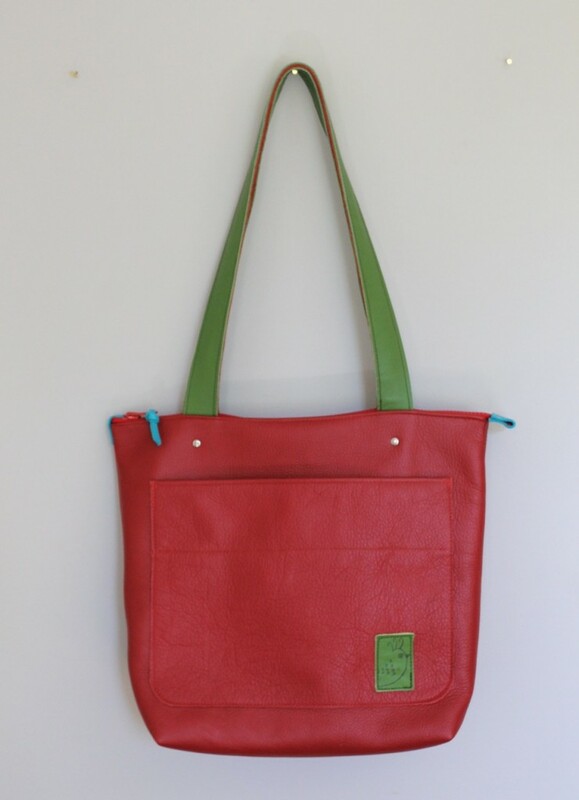 The fifth tote in the series, it is the same size as the other Delta totes, with most of the same details, yet it has its own personality. Pictured above is the lining with the zippered canvas pocket. I have featured this piece of Tanzanian cotton Super Wax Mama before–but I am still studying the border design and its layers of colour and pattern. 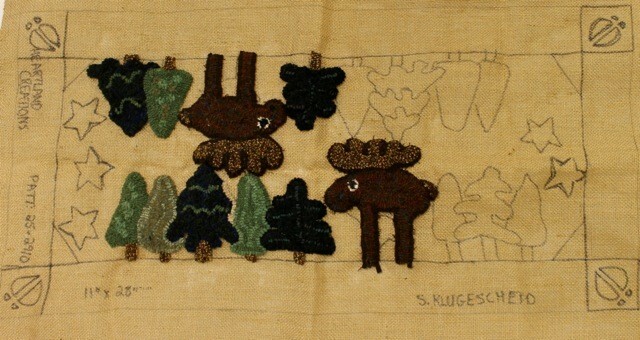 I am designing a new rug these days and am thinking about layers of background, one pattern over another. In the meantime, here is the Sage Delta on its way to completion. 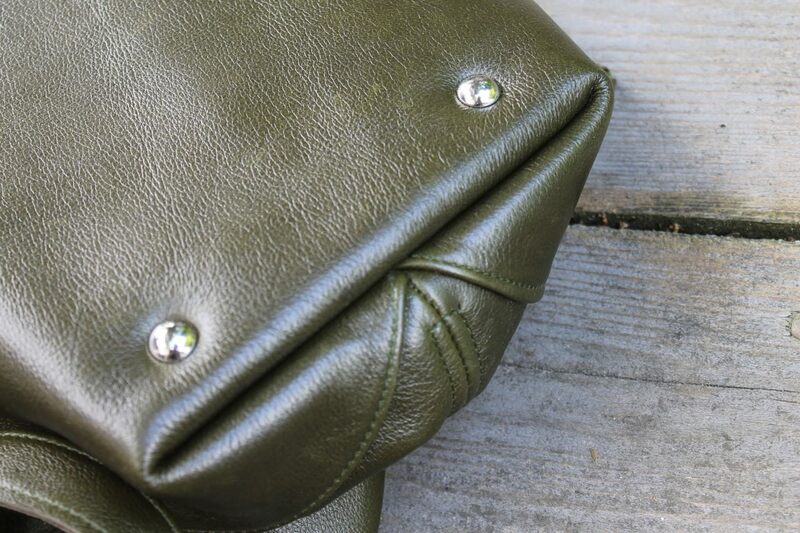 This is some of the most beautiful leather I have worked with–a rich subtle colour with memories of your herb garden. 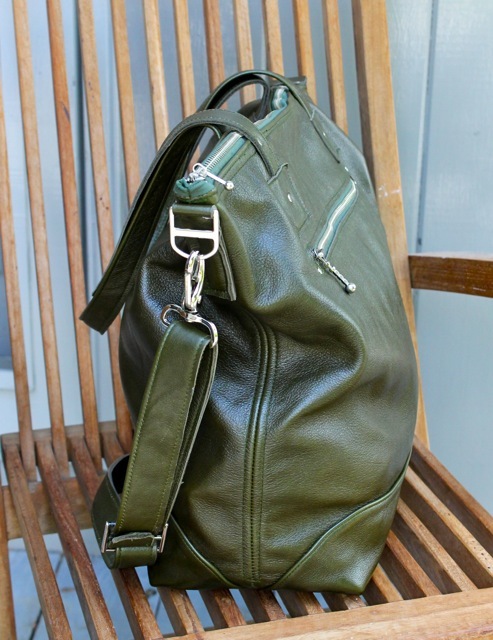 This is not a recycled piece–when you see leather this good, it’s hard to resist–and there is enough for another tote! Owen updated the blog and it’s still a bit under construction. I am slowly (well I have hardly started, but I will, promise) putting the photos back in the photoblog. 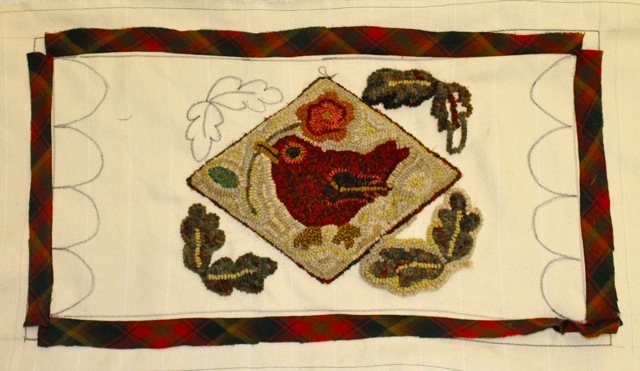 Having the rugs and bags that I have finished as a resource is something I think is valuable. It is a reference for you and for me. So it will be back before long with more information attached. Also, I am hearing from some of you that you are having trouble leaving comments. It was that issue that caused us to do the update in the first place–so if it is still occurring, that is if you get an error screen when you try to leave a comment, please let me know–send an email by hitting the contact button on the right under navigation. 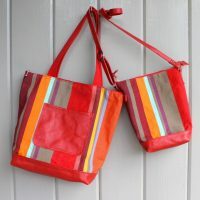 A positive thing that is happening is that the bags are selling, sometimes before they get in the on-line store. This is not a problem–but it does encourage me to encourage you that if you see something you like, go for it. And be sure to send me an email if there is something you want or an idea you have. I am always looking for inspiration. Below is the new Sage Delta–just in the preliminary stage. 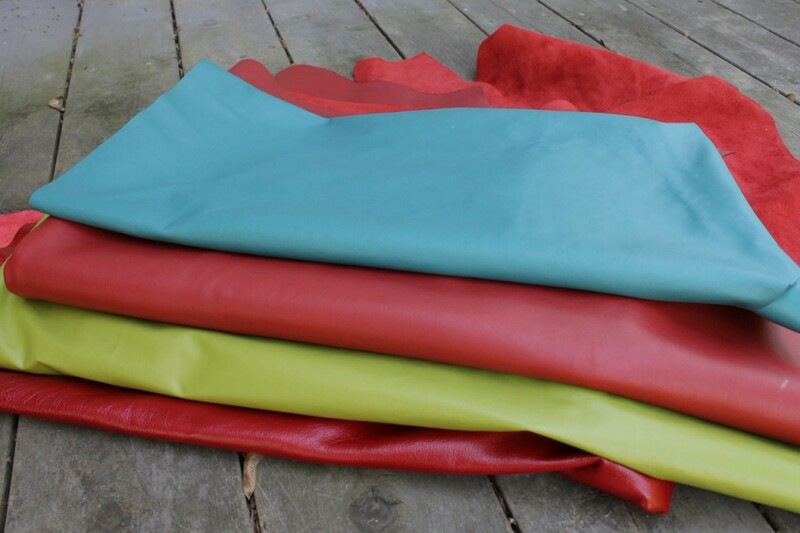 I am loving working with this very beautiful leather. As you can see it has a zipper pocket on the one side and will have a patch pocket on the other. I make my bags with features that I think are essential. Birdbrain bags have outside pockets and inside pockets, as many as I can make work. The large travel bags have two sets of straps, both shoulder and handles. The linings are interesting and playful–and always reinforced. The zippers are heavy duty and the seams are double stitched. I think that when you buy handmade you expect the personal touches–the special edition, not the run of the mill. And that is what I try to do. I don’t work in production–my joy comes from creating something new, from having a conversation with the leather and including handprinted graphics or cultural references–and from seeing you enjoy something that I have made. So thank you all for your support, stay in touch, and I will keep sewing. Pictured below the Delta is some new leather just waiting..maybe another triad! 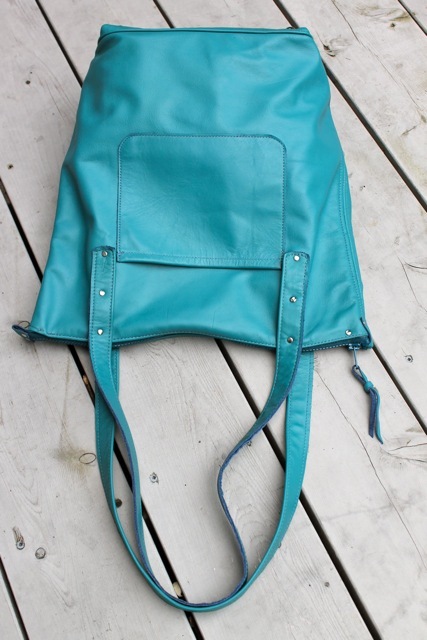 I love colour blocks and I’d like to try a colour block bag…but first I will finish the Sage Delta. This one has a deadline–a trip to England on July 1st! Amos put a comment on my blog yesterday. If you click on the wedding rug in the photoblog section you can read it. Amos is one of the people whom I taught to hook in Matangwe, Kenya. Through some kind of wired magic the residents of this small village on the other side of the world, a village without electricity or clean water, are in touch with me–they send emails, read my blog and are my friends on Face Book. 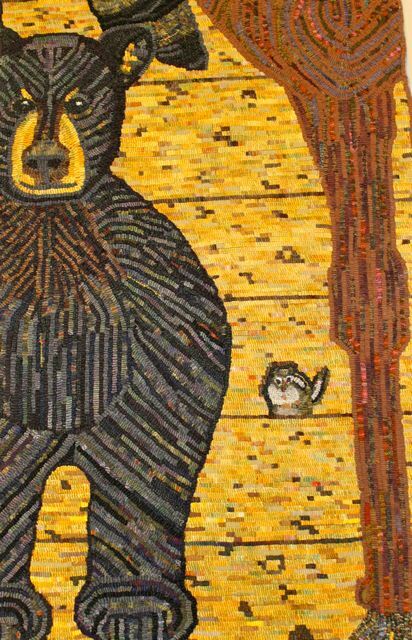 Amos was an eager rug hooking student. His very first piece, below, was beautiful. He designed it himself. I am showing you the reverse side for two reasons. First, so you can see the quality of Amos’ hooking, but also so you will notice the label. I’ve had these on the blog before–they are a collaborative design between Alice, one of the Matangwe students, and my friend and great designer, Melanie. This is just the beginning of what we hope will be a sustainable project for the men and women of Matangwe. 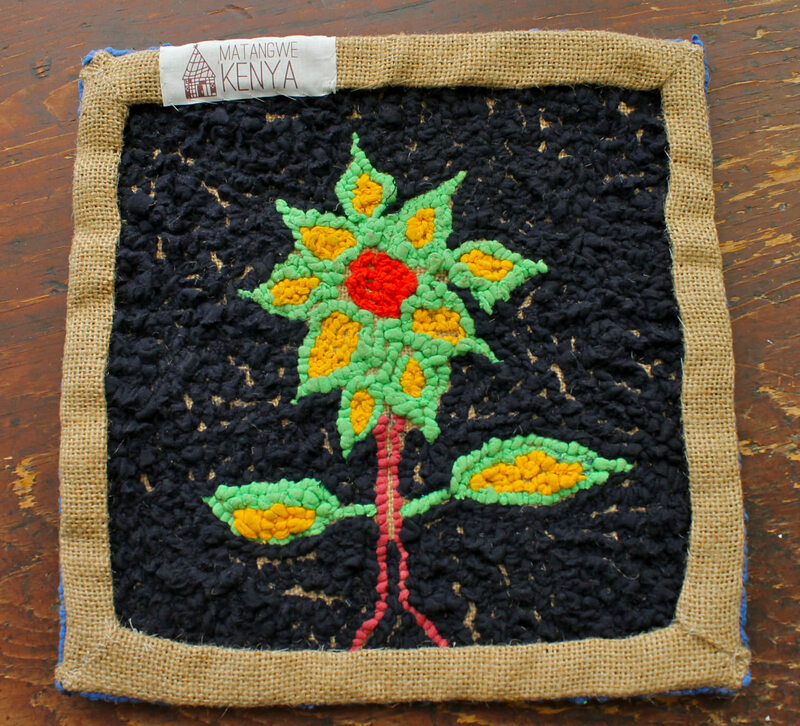 Amos has certainly been doing his part to further the craft of rug hooking in the Matangwe area. Below is a photo he sent of some of his students. You can see him in the front row. 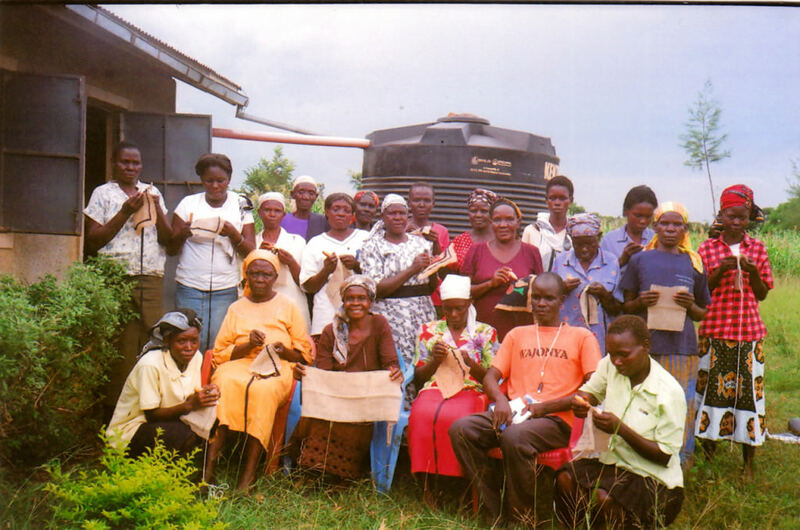 These women are using hooks and burlap which were donated by rug hookers in Belleville and Kingston Ontario. We are hoping to find a source for burlap in Africa but in the meantime, we will need more hooks and burlap for my visit next January. I am hoping to have some donated at the area hook-ins in the fall which I will be attending. This is just a small way that we can set the people of Kenya on the path to self-suffiency. More on this later! In the meantime, congratulations to Amos and the rug hookers of Matangwe. 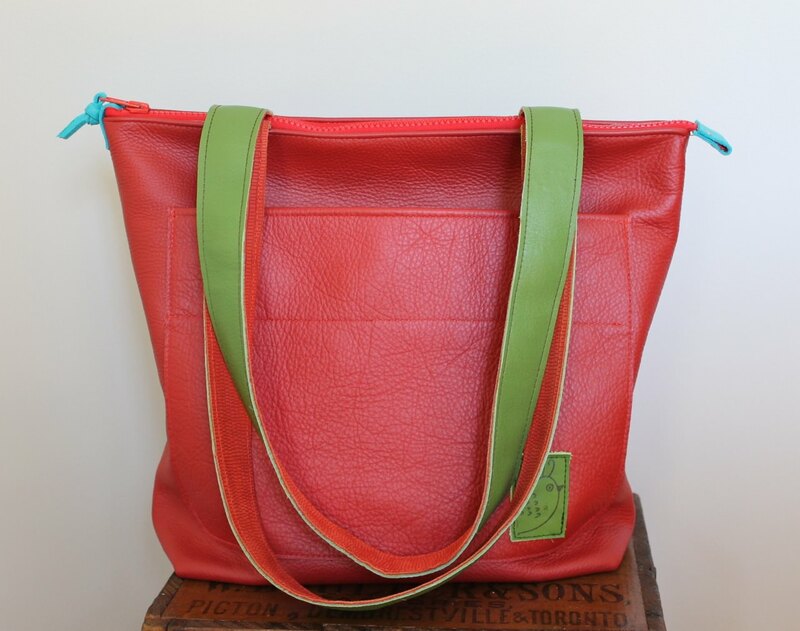 I had a few small pieces left of the lovely leather in this red tote and decided to see what I could come up with. If I combined it with some other pieces in my box of ends, there was just enough for a new tote, The Triad. 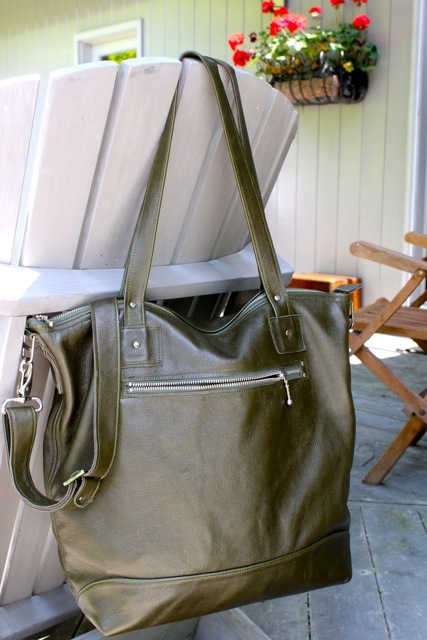 This tote is unlined with two green leather pockets inside and a roomy pocket on the outside. 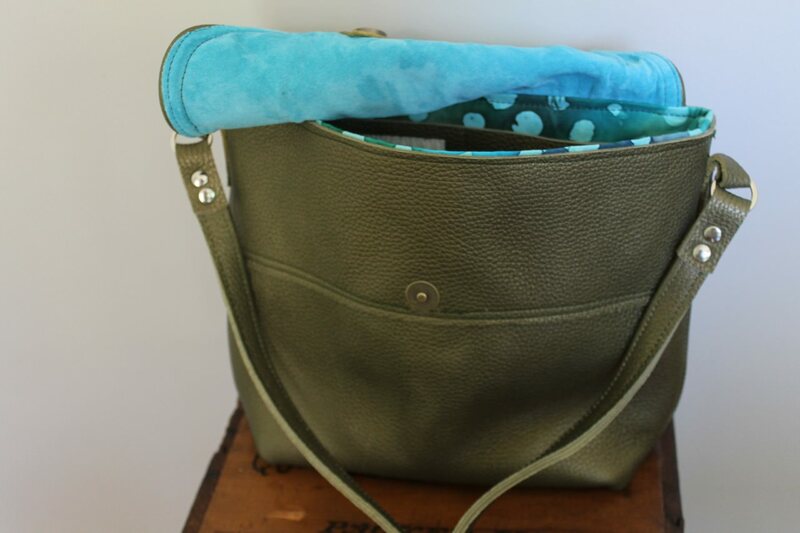 It is 14″ wide, 12″ tall and has a depth of 4.5″ The apple green handles have a 13″ drop which means they fit comfortably over your shoulder no matter how full the tote. 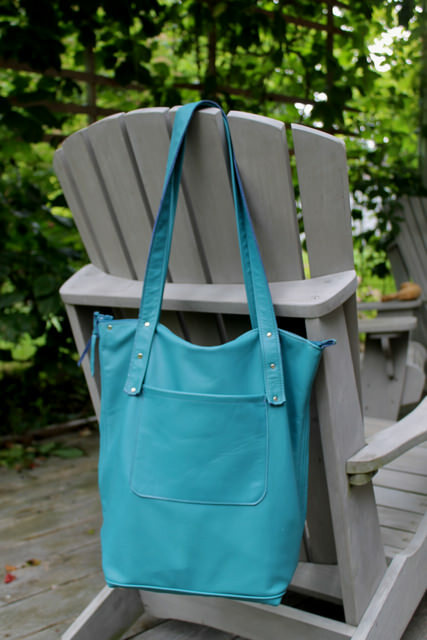 This is a great durable summer tote with a fun colour play. This is the new quarry bag. 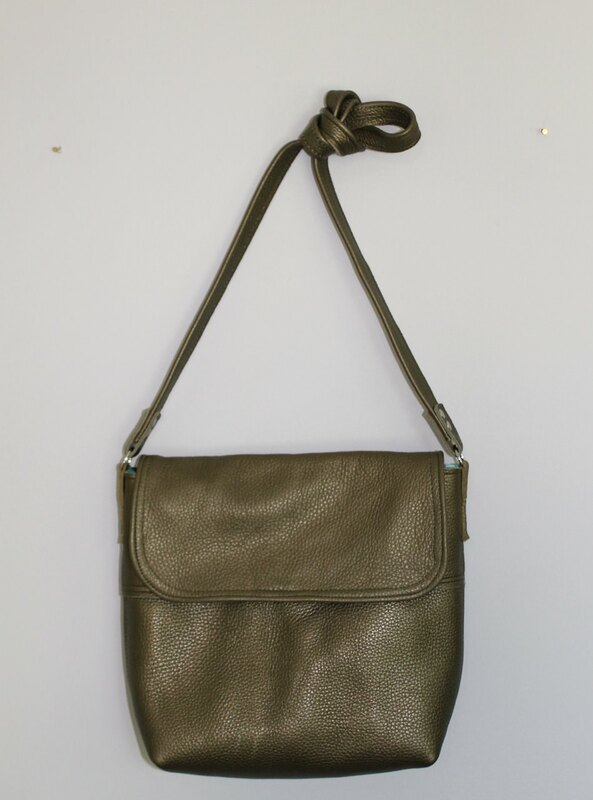 It is made from sturdy leather in a stone/mineral colour–a great neutral. 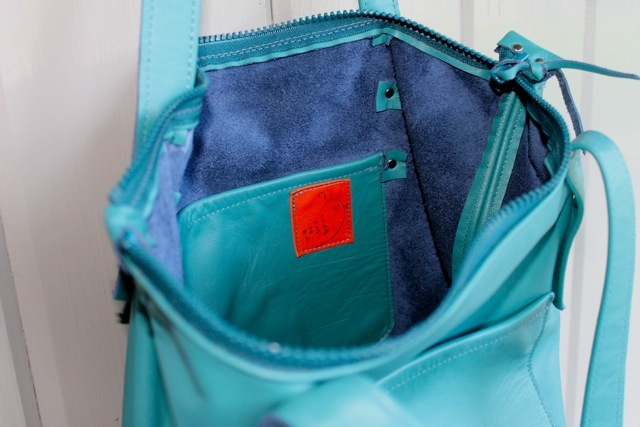 It has a front flap with a magnetic catch and is lined in turquoise suede from my friend Catherine’s once expensive shirt! The actual bag is lined with a polka dot cotton batik. Inside there is pocket for your phone and other small things and outside on the back is a zipper pouch, ideal for keys. 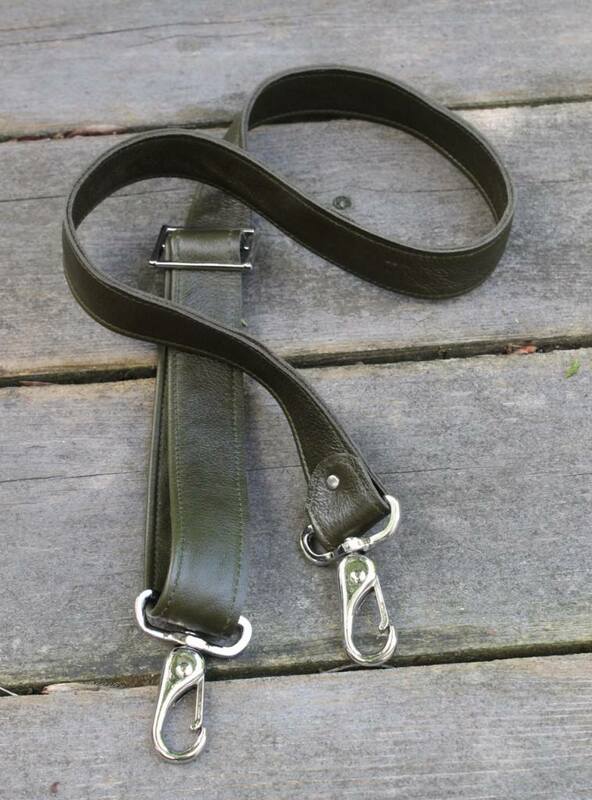 W 12″ L 9″ D 3.5″ with a strap of 46″, perfect for carrying cross-body. 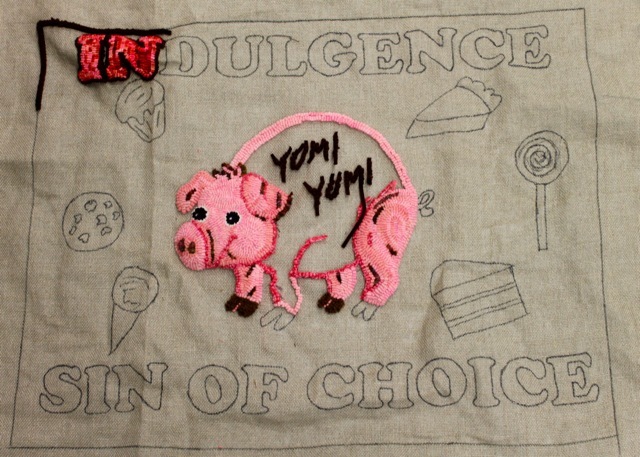 In the on-line store with another new bag soon.